Tetyana (Tanya) Lokot recently received her PhD from the Philip Merrill College of Journalism at the University of Maryland and is a contributing editor at RuNet Echo, Global Voices. 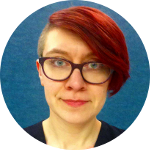 Her research and writing focus on the interplay between technology, digital media, and civic actors in the context of augmented protest, as well as issues of internet freedom and internet governance in Ukraine and Russia. She has worked as a journalist, non-profit consultant, and media trainer in Ukraine, Belarus, and Georgia, and speaks fluent English, Russian, and Ukrainian. As CIHR Fellow, Tetyana will research how civil society in Ukraine and its networks globally are working to influence the country’s internet policy, especially around issues of free speech and free expression online for journalists and civic activists. She will also focus on how civic actors in the Ukrainian and global context are able to combat state efforts to manipulate information and censor content online, promote digital and information security, and mitigate oppressive legislation on extremism and hate speech online.